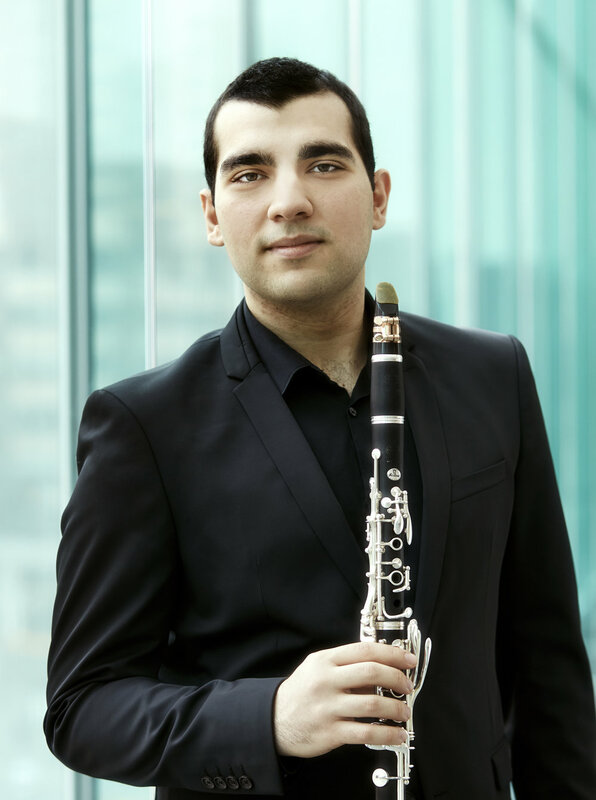 Clarinetist Narek Arutyunian is an artist who “reaches passionate depths with seemingly effortless technical prowess and beguiling sensitivity” (The Washington Post). He has performed the Copland Clarinet Concerto with the Orchestra of St. Luke’s at Alice Tully Hall as well as Artie Shaw’s Concerto for Clarinet with The Boston Pops. Mr. Arutyunian has also appeared as soloist with the Meridian Symphony, the Albany Symphony, the Long Bay Symphony, and the Longwood Symphony. He has performed recitals at the Washington Center for the Performing Arts, the Lied Center of Kansas, the Buffalo Chamber Music Society, the Weis Center for the Performing Arts, the Westport Arts Center, the Macomb Center for the Performing Arts, Music for Youth, Iowa State University, Southern Adventist University, Missouri State University, the Isabella Stewart Gardner Museum, and Carnegie’s Weill Recital Hall. Mr. Arutyunian has performed extensively in Australia, Asia, and in Europe, where he appeared at the Louvre in Paris and the Palazzo del Principe in Genoa, among others. He has appeared as soloist with the Prague Radio Symphony Orchestra, and in Russia with the Kaliningrad Philharmonic, the Moscow Virtuosi Chamber Orchestra and the Moscow State Symphony Orchestra. Mr. Arutyunian’s festival appearances include Juilliard ChamberFest, where he performed Osvaldo Golijov’s The Dreams and Prayers of Isaac the Blind, the New York Festival of Song, Krzyzowa Music Festival in Poland, Germany’s Usedomer Musikfestival, Musica Viva’s Huntington Estate and Sydney Festivals in Australia, the 2013 Young Concert Artists Festivals in Tokyo and Beijing, and the Marlboro Music Festival. Mr. Arutyunian’s growing career has also included numerous educational outreach programs in New York City public schools and around the country. His 2016-2017 season includes recitals at the Morgan Library and Museum, Pepperdine University, Oneonta Concert Association, and a performance as soloist with the Bucks County Symphony. Winner of the 2010 Young Concert Artists International Auditions, he was presented in debut recitals at Merkin Concert Hall and the Kennedy Center to rave reviews. By the age of 16, he had already won First Prizes in the International Young Musicians Competition in Prague and the Musical Youth of the Planet Competition in Moscow. He recorded the Weber Concertino for clarinet with the State Symphony Orchestra of New Russia. Born in 1992 in Gyumri, Armenia, Mr. Arutyunian’s family moved to Moscow when he was three. He graduated from the Moscow State Conservatory where he worked with Evgeny Petrov. He received his Bachelor’s degree from the Juilliard School, where he worked with Charles Neidich. He is currently a Master’s candidate at the Manhattan School of Music, where he continues his studies with Mr. Neidich. Mr. Arutyunian’s clarinet is a personal gift from the conductor and violinist Vladimir Spivakov. He receives general support for his career from the Guzik Foundation in California.